It’s been some time since my last post: after posting regularly for a couple of months I realized blogging is time consuming. If you have a blog, you knew that already. And if you don’t have a blog– you know now. And though I enjoy blogging, I also enjoy a whole lot of other things, and then there is a whole lot of things, not necessarily enjoyable, that have to be done. Less time online directly translates into more things getting done off-line, and I am fine with that for now. One thing that I do love about blogging is the exchange of useful ideas. 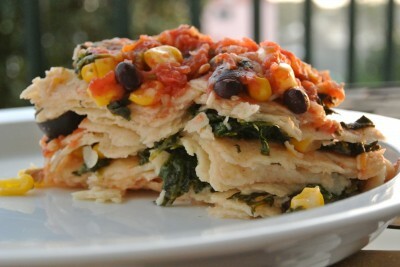 Today’s great idea is this crock pot spinach and bean enchiladas. The idea is not mine, I borrowed it from Morgan (she has a lot of other great ideas on her blog, so be sure to check it out when you have time). Three things make this recipe appealing to me: 1) it can be easily modified based on what you have on hand, and on your preferences, 2) as far as enchiladas go, this one has a higher ratio of filling to tortillas, which is a plus in my book, and finally 3) It is done in a crock-pot– this one is self-explanatory, right? * Whenever I brown ground beef for a dish, I make sure to make extra, portion it out in freezer bags, label and stash in the freezer. I do the same with chicken. It has become a standard way for me to come up with quick dinners during the week. ** I used to cook with frozen spinach until I tried using fresh spinach, lightly sauteed and drained. I will not go back to frozen kind– the texture of fresh spinach is so much better. I don’t mean those huge bunches that require triple washing though (too time consuming), but the pre-washed kind in a plastic tub. *** If you use good quality cheese and grate it yourself, you will need LESS cheese (=lighter dish) to achieve great taste. I like Tillamook brand. 1. Brown the ground beef, breaking the clumps. Move to a plate. 2. Saute spinach in a little bit of oil until it wilts (it only takes a few minutes). Move to a colander and squeeze out as much liquid as possible by pressing it against the sides of the colander with a wooden spoon. 3. Combine the beef, spinach, and the rest of the ingredients, except for 1 cup of cheddar. 4. Spread 1 1/2 cups of enchilada sauce in the bottom of a crock pot. 5. Spread three tortillas and add 1/3 of the bean mixture, layer and repeat two more times. 6. Top with the remaining enchilada sauce and cheddar. Cover and cook until heated through, on low for 2 1/2 to 3 hours. That giant cup of tea was not gonna drink itself. After the tea and dessert at La Madeleine cafe were done (a great Mother and Daughter date idea) , we headed back home and gobbled up that bean and spinach enchilada (with beef). It was that good! Sounds really good, Mila! I would never have thought to put tortillas in a crockpot. Love your “tea” date! Amy, tortillas worked really well, leftovers also reheated very well. Kids were fighting over the leftovers:) I think it is important to not let them over-cook. This sounds delicious. And healthy. I’m always on the lookout for easy healthy WW friendly slow cooker recipes. Thanks for the inspiration! Hi Martha, thanks for stopping by! I have made it several times already- I like the fact that the ratio of filling to tortillas is higher compared to traditional enchiladas. And adding spinach bumps its nutritional value a notch. I hope you like it.